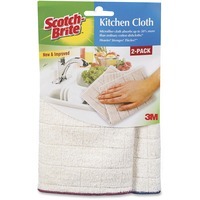 Microfiber Kitchen Cloth absorbs up to 50 percent more than ordinary cotton dish cloths. Microfiber lifts and traps dust and removes fingerprints. Use it to lift and trap dust without chemicals. Lint free, streak free, scratch free cloth rinses clean and dries quickly for fast reuse. Machine washable cloth lasts through hundreds of washings.